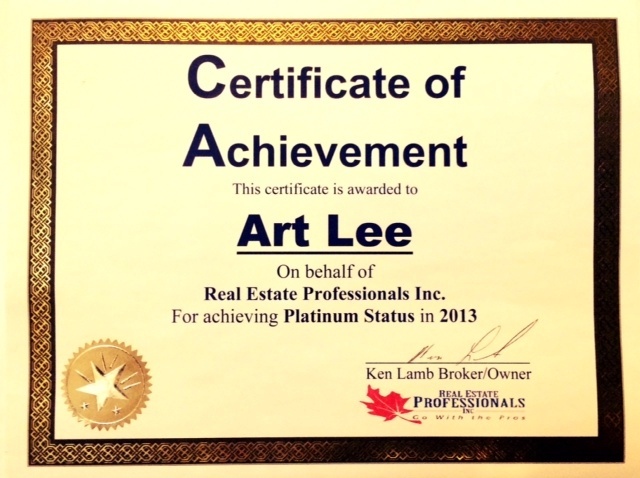 Today I attended the REAL ESTATE PROFESSIONALS INC ANNUAL AWARD BREAKFAST at the beautiful Glencoe Club. I had the pleasure to meet many great associates in my office whom I've never met and also had the chance to reconnect with others. I was pleasantly surprised and honored to receive the PLATINUM AWARD for 2013 (11th overall for 2013 in my office of 220+ agents). I'm humbled to have had such great success in 2013, but most importantly I'm so very grateful to have so many wonderful clients. It’s extraordinary how quickly friendships grow when you’re driving your clients around, night after night house shopping! Sometimes the search lasts just a few short weeks, sometimes months and sometimes years. I’ll always remember those late night meetings in Tim Horton’s, walking into a home shocked to see tenants who were not suppose to be there (they were just as shocked as us ha-ha), letting a cat out by accident and chasing it around Tuxedo (never caught it) and laughing in my car because the home we walked into smelled so bad of cat urine. I love my job and cherish those moments always. Thank you to all my amazing clients who allowed me the opportunity to help with their real estate goals. Thank you for putting your trust in me and thank you for all the referrals. You all know who you are and I will be forever thankful. Wishing everyone all the best in 2014!